Does your home run on propane? Whether you use it for home heat or other appliances, propane is a safe, clean-burning, efficient energy source. But just like any other type of fuel, it’s important to follow basic safety tips during use. Winter is prime usage season for propane, which makes it a great time to check on your tank and appliances. And if you haven’t already had your Reidsville furnace repair company out for an inspection and tune-up, the sooner the better. Keep these 6 winter weather safety tips in mind throughout the year. Get your tank refilled before you run out of propane. It’s always best to stay on top of propane refills. When a tank gets completely empty, there’s a risk of leaks and other problems due to internal tank pressure (or lack of). A gas line and tank inspection is absolutely crucial before a completely empty tank is refilled. Not sure you can remember to schedule refills? No problem. Sign up for a regular delivery plan with Carolina Fuels and you’ll never run out of propane. 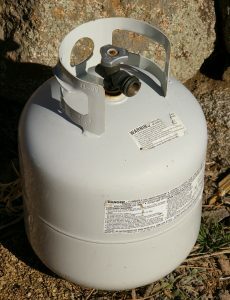 Keep the area around your propane tank clear. Don’t let vegetation encroach on your tank for a variety of reasons. For one, plants growing on and around your tank can cause premature corrosion of your tank from the outside, which can eventually reach the inside. Clear snow off and away from your tank as well to avoid added stress on your tank. A damaged tank is a potentially dangerous tank. Also, keeping the area clear makes it easier for Carolina Fuels to check and refill your tank, especially in the case of an emergency such as a gas leak. If you smell gas, leave the home and call Carolina Fuels. If you smell gas inside or outside your home, turn off all appliances and lights and get everyone out of the house and to a safe distance away. Then call Carolina Fuels. Don’t use your phone until you are at a safe distance from the house. If you don’t reach anyone right away, call 911. Never use a propane grill inside. Your backyard grill is not meant to be used indoors for any reason, cooking or space heating. It requires outdoor ventilation of carbon monoxide. Never use your propane range as a heat source. If the power goes out or your furnace quits working, never attempt to use your oven to heat your home. Schedule routine Reidsville furnace repair and appliance inspection. Yearly inspection for your furnace is an important step for safe propane usage. A properly working furnace will efficiently use propane and vent carbon monoxide outside the home. A dirty or malfunctioning furnace can cause carbon monoxide to contaminate the air inside your home, which can cause all sorts of health problems and even death. Carolina Fuels wants you and your family to be safe while enjoying all the benefits of propane. Follow these safety tips and you can safely heat your home, cook your food, dry your clothes, heat water, and more with propane. Call Carolina Fuels today to schedule Reidsville furnace repair: (336) 623-9741.